Drug crime is highly prevalent in the Lonestar State. With much of the state bordering Mexico, the international drug trade is a booming business in Texas. Individuals caught trafficking drugs into or out of the state face steep fines and serious jail time. While marijuana is often thought to be the more so meek and mild illicit substance of abuse in the area, using it isn’t without penalties. Possession alone, of even small amounts, can bring a sentence of six months in jail and $2,000 in fines.7 Possession of cocaine warrants two years in prison for less than 1 gram while more than 200 grams can impose a 99-year sentence.8 Similar penalties apply for possession of like amounts of heroin in the state. Just 2.5 million people sought treatment for their substance abuse issues in America during 2013, accounting for around 11 percent of those who needed help.31 In Texas, 39,676 people sought treatment that year.32 Thus, around 17 percent of the national population who needed treatment received it in Texas. 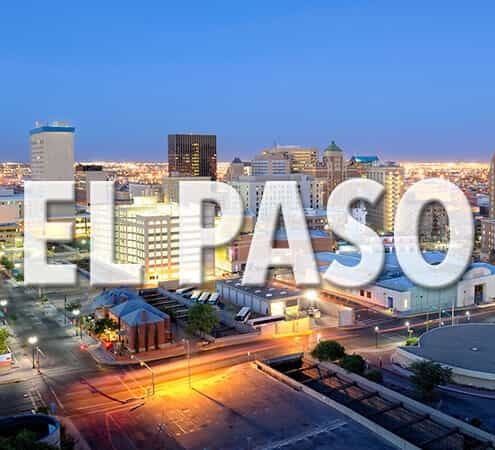 If paying for treatment is a problem, El Paso area facilities and local government agencies may be able to help. Between 2005 and 2008, 37.4 percent of individuals who needed substance abuse treatment but did not receive it cited a lack of health coverage or means to pay for treatment as their reason.36 A few facilities offer grant services that may cover a portion or all of the treatment costs. Sliding scale fees are also an option at some facilities. Using such a program, you would provide the treatment center with information on your household income, assets, and family size. They then take those factors into account when setting up your treatment plan and base the cost of medical detox and other services on what it appears you can reasonably afford. 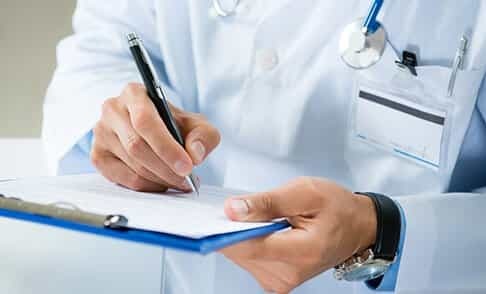 Verifying treatment credentials and facility staff members’ credentials is just as important as knowing your insurance is accepted at a given rehab center. Texas imposes certain requirements that facilities and their employees must meet in order to operate legally within the state. It is vital that you understand the positions certain employees hold and what they are actually capable of doing for you, too. For example, if you need treatment for a co-occurring mental health disorder, you will want to veer away from facilities that do not have qualified professionals on staff that can render diagnoses and treat mental health conditions. While a certain facility may promote their ability to treat mental illness, they may not be able to provide prescriptions for certain medications that many with mental health disorders require. They can get away with claiming to treat these conditions because they do so in a holistic fashion that doesn’t require their staff to have prescribing rights. Without a doctor on staff, they don’t have these prescribing rights. Likewise, without a qualified professional in the psychiatric field, getting any clear diagnosis for your symptoms may be difficult, if not impossible. Other resources that can guide you in choosing the best form of treatment for your co-occurring conditions include the National Alliance on Mental Illness, El Paso Chapter, the El Paso Psychiatric Center, and the El Paso Behavioral Health System. “Texas Drug Control Update.” (n.d.). White House. Accessed September 18, 2015. “El Paso Health Report.” (n.d.). 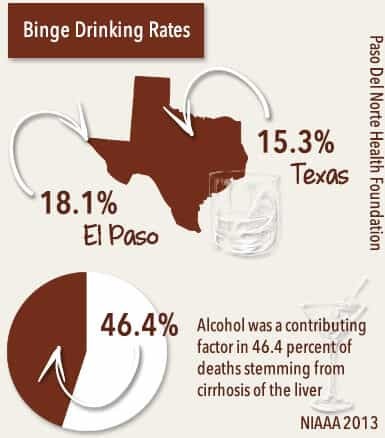 Paso Del Norte Health Foundation. Accessed September 18, 2015. “The Partnership Attitude Tracking Study: Hispanic Teens and Parents.” (n.d.). Partnership for Drug Free Kids.Accessed September 18, 2015. Ray, J. (2014 Dec 2). “Drug Overdose Deaths Have More Than Doubled in the U.S.: CDC.” NBC News. Accessed September 18, 2015. “Texas Laws & Penalties.” (n.d.). NORML. Accessed September 18, 2015. “Texas Cocaine Laws.” (n.d.). FindLaw. Accessed September 18, 2015. “Alcohol Facts and Statistics.” (n.d.). National Institute on Alcohol Abuse and Alcoholism. Accessed September 18, 2015. Uribe, C. (2014 Jan 13). “Deaths, DWI numbers in El Paso ride for 2013.” Fox News. Accessed September 18, 2015. “State Map.” (2013). Foundation for Advancing Alcohol Responsibility. Accessed September 18, 2015. “Texas DUI and DWI Laws.” (n.d.). NOLO. Ibid. Accessed September 18, 2015. “State Estimates of Adult Mental Illness from the 2011 and 2012 National Surveys on Drug Use and Health.” (2014 Feb 28). Substance Abuse and Mental Health Services Administration. Accessed September 18, 2015. “State Statistics: Texas.” (2010). National Alliance on Mental Illness. Accessed September 18, 2015. McCormick, A. (2015 Jun 6). “Adam McCormick: Children’s mental health must be priority.” El Paso Times.Accessed September 18, 2015. Rosales, E. (2013 Sep 6). 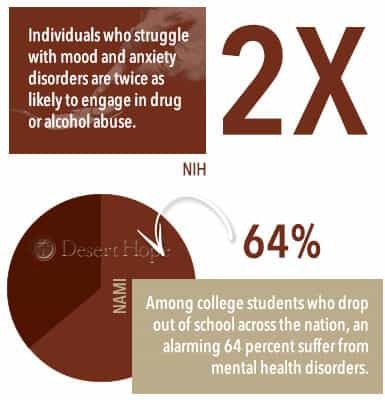 “Counselors see a rise in mental health issues among college students.” Borderzine.Accessed September 18, 2015. Reingle, J. (2015 Jan 9). “Mental health care lacking in state and federal prisons.” The University of Texas.Accessed September 18, 2015. “Severe mental illness tied to higher rates of substance abuse.” (2014 Jan 3). National Institutes of Health.Accessed September 18, 2015. “College Students Speak: A Survey on Mental Health.” (2012). National Alliance on Mental Illness. Accessed September 18, 2015. Sullivan, E.M., Annest, J.L., Simon, T.R., Luo, F. & Dahlberg, L.L. (2015 Mar 6). “Suicide Trends Among Persons Aged 10-24 — United States, 1994-2012.” Centers for Disease Control and Prevention. Accessed September 18, 2015. “Risk of Suicide.” (n.d.). National Alliance on Mental Illness. Accessed September 18, 2015. “Substance Abuse and Treatment Facility Locator.” (n.d.). Substance Abuse and Mental Health Services Administration. Accessed September 19, 2015. Accessed September 18, 2015. Virag, T.G. (2008). “Results from the 2008 National Survey on Drug Use and Health: National Findings.” Diane Publishing Company. Accessed September 18, 2015.
http://www.drugwarfacts.org/cms/Treatment#sthash.JbV1WhrP.dpbs Accessed September 18, 2015. “A National Review of State Alcohol and Drug Treatment Programs and Certification Standards for Substance Abuse Counselors and Prevention Professionals.” (n.d.). U.S. Department of Health and Human Services.Accessed September 18, 2015.